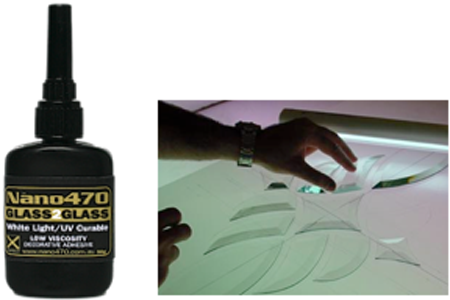 Nano470 Decorative Glass Glue is the preferred choice of home design experts, artists and DYI enthusiasts who need a high quality decorative, invisible curing glass bond. This low-viscosity liquid adhesive is the perfect glue for applying beveled glass-to-glass, logos to glass, and mirror to glass, and cures easily with any fluorescent light, with no need for UV rays. Nano470 Decorative Glass Glue comes in an easy-to-squeeze and pour 20g (0.7 oz.) bottle and can provide a strong invisible bond that will enhance all types of glass-based projects. Whether the job calls for significant bonding or lightweight decorations, Nano470 Decorative Glass Glue leaves a clean finish with no smudging or streaking, and is 100% safe for everyday use.